One of the most exciting things about being a UN Volunteer is having the chance to work across diverse activities which aim to help the Haitian people in a variety of ways. Being the focal point for ten separate Community Violence Reduction events to mark International Day of Peace on 21 September gave me exactly such an opportunity. 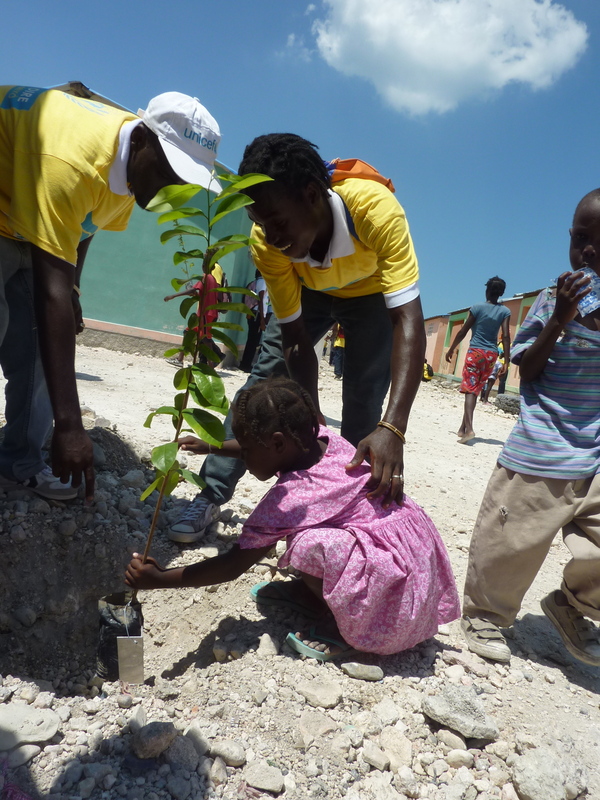 A child from Cité Soleil helps a CVR beneficiary plant a tree in celebration of International Peace Day. (Photo: Caroline Knepper, UNV 2012). Port-au-Prince, Haiti: I have been working in the MINUSTAH Community Violence Reduction (CVR) Section since May 2012 as a Programme Officer in the Project Unit. My role is to identify, select and develop potential projects aimed at reducing violence within communities. One of the most exciting things about being a UN Volunteer is having the chance to work across diverse activities which aim to help the Haitian people in a variety of ways. Being the focal point for ten separate CVR events to mark International Day of Peace on 21 September gave me exactly such an opportunity. Starting two months in advance, my role leading up to the day was to coordinate not only with other MINUSTAH sections and military contingents, but with those Haitian partners who would stage events on the day. One priority was to work with local community organizations to jointly develop activities that would promote dialogue in the community regarding ways to encourage peace. In addition, we collaborated closely with the Haitian state to coordinate activities. I attended many meetings with the Ministry for Youth, Sport and Civic Action (MJSAC) to incorporate youth as much as possible into the day, and with the Haitian Football Federation (FFH) to plan a football match between MINUSTAH contingents, Haitian National Police and two local community teams. After a great deal of planning with each partner, I was delighted with the success of International Peace Day. One of the most popular events was the finals of a week-long championship titled, Match for Peace and Security between football and basketball teams of youth from different neighbourhoods in Cité Soleil, one of the most fragile zones in Port-au-Prince. In the same area, on 21 September, beneficiaries from a CVR vocational training project joined forces with local children to plant trees. Across the city, other partners collaborated with CVR to host informal community forums and formal debates and workshops to stimulate discussion about violence in the community and how to work together towards peace. Many of the events included cultural elements to promote peace through music, dance, artists exhibitions and theatre, including a day of celebrations on 22 September in Champ de Mars, one of the main public squares in the capital. In Haitis North Department, CVR also coordinated with a local womens group to stage a peace march and a large public debate in a town square exploring the theme Violence is a handicap to development. Overall it was a great experience for me to be so involved with Haitian and international partners to celebrate International Peace Day and I look forward to working on similar events in the future. Bio: Marie Dibangue (Douala, Cameroon) is a UNV Community Violence Reduction Officer. She has been working in the MINUSTAH Community Violence Reduction Section since May 2012 as a Programme Officer in the Project Unit.